Don't let your message get lost by using a generic email marketing list. The specific people you need to talk to are right here in this premium Jordan email database, filled with the real contact information of valuable sales leads. Jordan is a geographically and economically important place to establish a business presence, but to sell products in Jordan, you need a business database with reliable information and real email leads. What you need is this Jordan mailing list. We will help you speak directly to senior executives and key influencers in Jordan with our comprehensive Jordan email list. At Bookyourdata.com, we go the extra mile to make sure that the B2B email list that you buy from us has all of the vital contacts that you need. 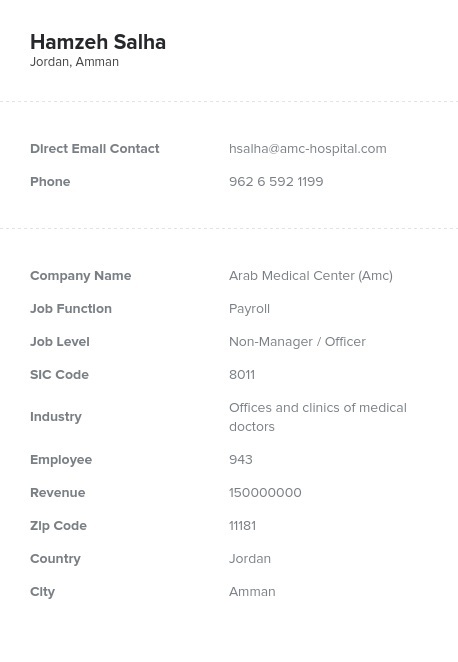 Our Jordan email database has all of the accurate names, email addresses, and phone numbers you need to make quality B2B contacts. It also includes company information, mailing addresses, and even fax numbers, so you'll be armed with a wealth of key data before you reach out. And like every email marketing list we sell, this list of Jordanian sales leads contains only authentic, usable information. We double-check all of our data on a regular basis, both with machines and human eyes, to make sure that it's accurate. We even back that promise with a deliverability guarantee, so you know you'll get the most value for your money when you buy a business contact list here. Try it today and see!